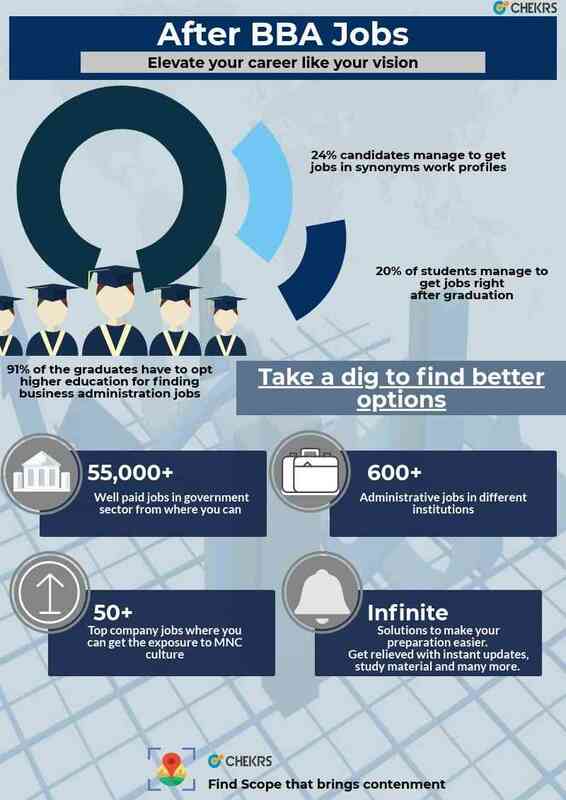 Have you completed your degree of BBA and searching for job? Happy tiding for all of you, Chekrs has come up with the solution to provide you the BBA Job Recruitment that enhances your chance to meet the best BBA Job Opportunities. The options after BBA in the government sector are very versatile one can get BBA Job Recruitment in any of the department based on his interest. However, majorly the work handled for BBA Graduate Jobs is to look after the account handling, data management and supervise the functioning. Well you can know the complete details of central and state level Government Jobs after BBA comprehending the eligibility criteria, selection process and every other minute detail. When we say you get unlimited option, we strive to stay true to its literal meaning. Not just the Sarkari Naukri for BBA but you are also provided the choices coming from the top private companies. As you aim only best, here you get the notifications of all those including Jobs for BBA Freshers which are diversified based on your working functionality such as Jobs after BBA in HR, Finance, etc. You can also get the variety in terms of the place you want to work such BBA Jobs in Banglore, Delhi, Mumbai, Hyderabad, etc. Also, Chekrs gives you the opportunity to avail the free subscription of enjoying the Latest Jobs for BBA as soon as they are updated. Why Chekrs for Upcoming BBA Jobs? We understand how important it is for you to get selected. With the same goal we work towards providing the study material that can aid you in the tough competition of Govt Jobs for BBA Graduates. Moreover, you get the detailed syllabus, previous papers and model papers as per the vacancy you have applied for. Also, you can avail the free of cost mock tests and quizzes to sharpen your knowledge and practice. BBA Job Recruitment, BBA Jobs in Banglore, Delhi, Mumbai, Hyderabad, BBA Government Jobs, Jobs for BBA Freshers, Govt Jobs for BBA Graduates, Sarkari Naukri for BBA, BBA Graduate Jobs, Jobs after BBA in HR, Finance, BBA Job Opportunities, Latest Jobs for BBA, Government Jobs after BBA.